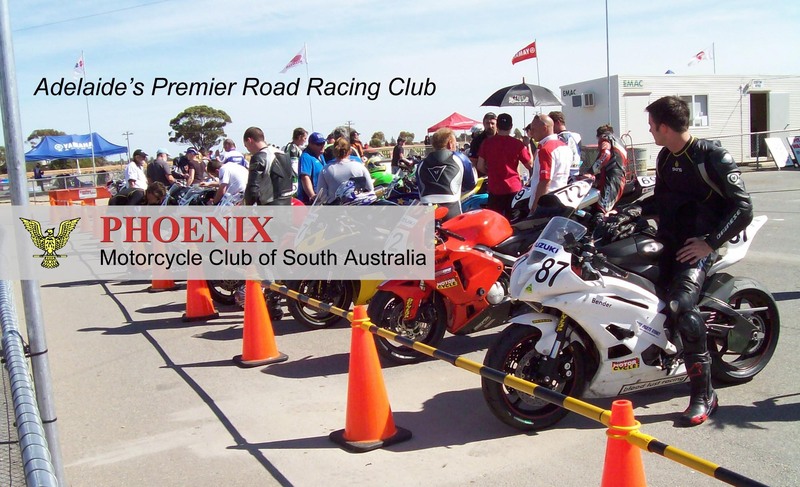 Bracket Racing is used in SA as our entry level class. It’s only open to C and D grade riders, but the race is restricted to 28 riders and D (novice) grade have preference. Contact the club for more information. This concept was borrowed from drag racing and they are essentially handicap races based on your lap times in qualifying. Any rider/bike entered can potentially win their time bracket. Qualifying sessions are held in the morning where your best lap time is taken and that time determines your row on the starting grid for the whole day. There are 4 riders in each row on the grid and while there are other riders in that race, you will only be competing against the 3 riders in your row. So you have a 25% chance of winning a trophy. As there are riders of differing ability on the grid, the fastest riders are in the front rows and the rows are double spaced to reduce tangling in the first corners. As you gain experience over the year, your times will improve and you will move up the grid into faster groups. The fastest rider on each row is placed in the ‘pole ‘position (left side of track) and their qualifying time is used for the bracket. If you go under that qualifying time by more than 1.5 seconds during a race you will ‘break out’ of your bracket and will be awarded 0 points for the race. This is to prevent riders going slow during qualifying to get an ‘easier’ bracket then going faster to win. In the event of inconsistent weather conditions, break out times may be waived or varied at the promoter’s discretion. Your lap times will depend on your bike and your ability to ride it. A good rider on a 650 may have lap times equal to a poor rider on a 1000. Because you are only competing against people doing similar lap times, it doesn’t matter what bike you ride, it can be a street bike or a modified racer as long as it meets the Rules. Bikes have to be prepared the same as for Class Racing. However, if you have not raced in the last five years, you can race in Brackets only for up to two meetings as a P plate rider with exemptions from several preparation rules. This will allow you to try the sport whilst developing your bike.